It’s a feeling I’d have been expecting a few months from now. It should hit when the school year ends, and I realize my oldest daughter is officially a high school junior, and I only have two more years to expect her to come walking in our door every night, going to sleep in that queen-sized bed, leaving socks and pajamas in a pile on the floor every morning. So to get teary-eyed about my daughter growing up on a random February morning caught me by surprise. Though I’ll admit that I cry a lot more easily these days, and it doesn’t take much to get me all sentimental. But this time a picture did it. No, it wasn’t the one of her holding the driver’s license she got last week, nor the cute picture she posted on Instagram from her elementary school days. 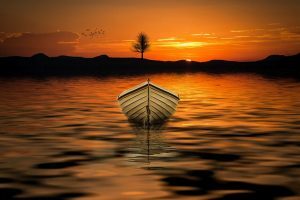 It was a picture of a boat on a lake at sunset. That picture prompted these thoughts. It’s like that sweet daughter has spent years here with us, safe in the harbor. Her dad and I have directed where she went and when. We’ve been able to guide and correct that boat to a great degree. Not that there weren’t rough winds and waves splashing up on the shore and rocky paths to navigate together. There were – and I’m sure there are still some more ahead of us. 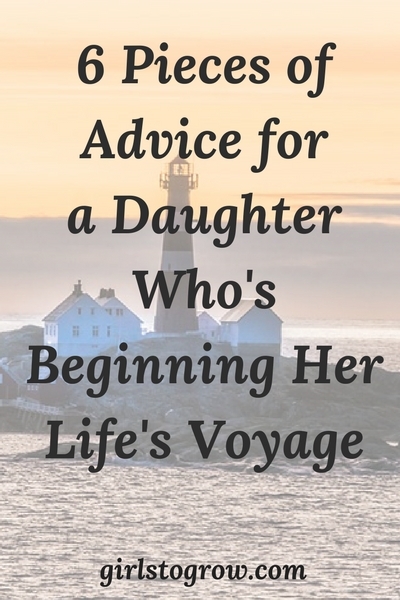 But before long now, she’ll push away from the dock, set off in her own boat, begin the voyage that will take her out into the life that God has for her. And that little boat will seem so tiny out on that big ocean all by itself. She’ll chart her own course as we watch, sometimes from nearby, sometimes from far away. So, since I’m an ex-school teacher, and always take the opportunity to slip a little advice her way, I thought I’d have some words of wisdom ready for her as she navigates her way out into the world. 1. Let God be your captain. Pray for His guidance, study His Word, yield to His leading. Nothing is more important. He will always guide you well. 2. Be true to yourself. God made you special. He put dreams and desires in your heart that He meant you to fulfill. Don’t allow other people to dictate who you become or where you go, but follow the course that’s meant for you. 3. Love those God gives you with all your heart. Treasure the relationships you have, whether it’s friends, a husband, children. Be loyal and passionate in loving your people. 4. Be bold and brave in chasing your dreams. Be willing to step outside of your comfort zone, and fight your fears. It’s fitting that we talked about this quote just a few weeks ago. 5. Make time to serve others. Life will be mighty empty if you make it all about yourself. Wherever you are, find a way to bless someone else, to make another person’s life a little easier and a little happier. 6. Live in the present. Don’t think that when you reach that certain port you’ll finally be truly happy. Whether it’s marriage or parenting or that promotion or a ministry opportunity, don’t waste today wishing for tomorrow. In fact, when you look back, you just may see that the actual journey was more fulfilling than the reward. And I’ll finish by taking that last piece of advice for my own. I’m not going to wish I was back in the preschool phase or the elementary days, nor am I going to waste the next 2 1/2 years dreading her high school graduation. 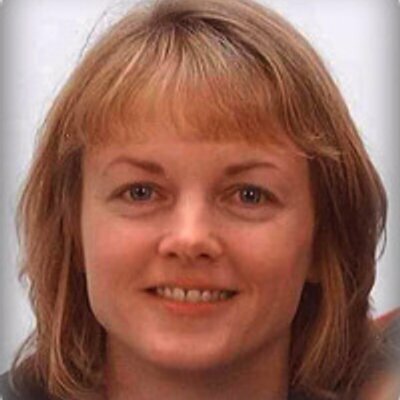 I’m going to wash that school uniform tonight and pack her lunch tomorrow morning and let her drive us down the highway to school – and enjoy today’s moments as they come. We often hear the term “strong-willed child.” I would certainly say we have one that fits into that category! I like this definition from Aha! Parenting.com. Give me wisdom to parent this child. James 1:5 promises that God will answer this prayer! I certainly need wisdom to know how to handle the daily struggles that come when she continually wants her own way, right then, no matter what. 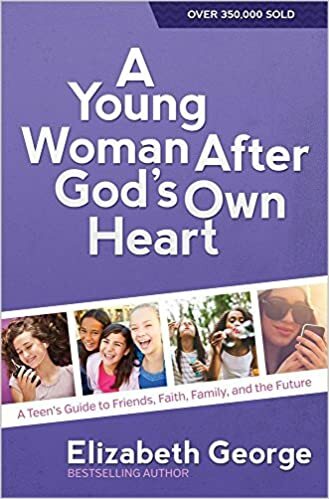 Draw her to Yourself in salvation early in life. 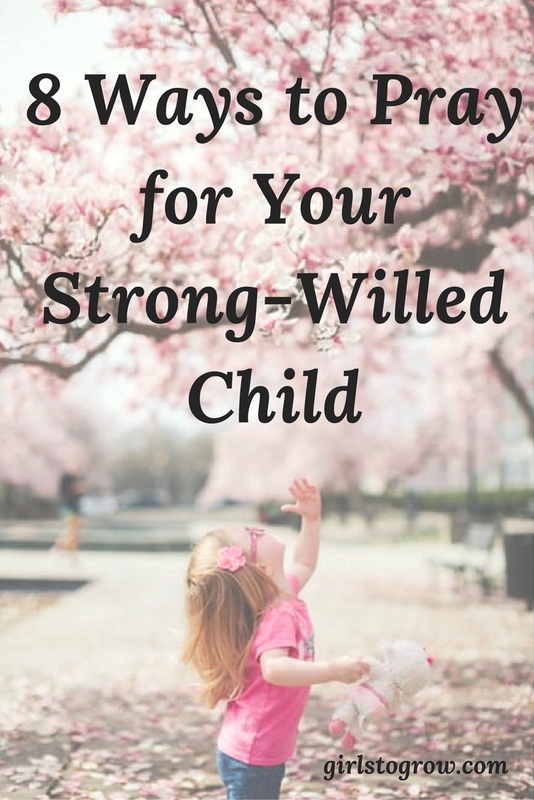 Our ultimate desire in training our children is to have them be willing to submit their will to God’s. Teaching them to obey authority they can see and hear will hopefully lead to their obeying God and His Word. Help me to be firm in setting boundaries. We get tired, and it’s so easy to cave in and just let her do what she wants. If you’re like me, you just want peace in your family! Every issue doesn’t need to turn into a power struggle (which is why I need wisdom), but when I take a stand, I need to see it through. Channel her strong will into courage to stand up for what’s right. Help me see the positive potential in her nature. Use her to be a voice for those who are weaker, and to do great things for the cause of Christ. On those days when I’m exhausted from the constant power struggles, remind me to find my strength in You. Psalm 22:19 says, “But be not thou far from me, O Lord: O my strength, haste thee to help me.” God can give us the help and strength we need for each day. Grow her desire to obey. So often that’s what it’s all about – obedience. Recognize and praise those times when she actually does do what she’s asked without a fight! As I parent her, show me how often I put my wishes and desires above Yours, so that I may repent. 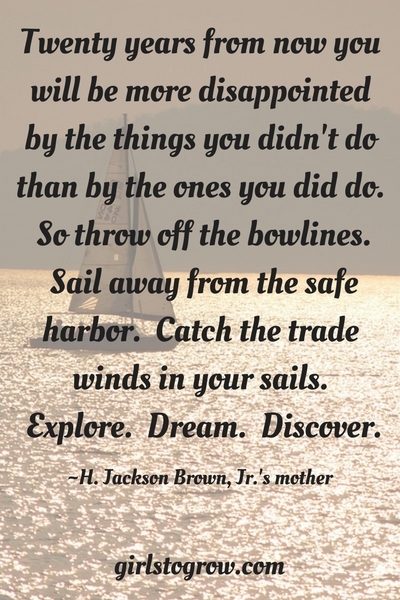 I’ve learned more about myself through parenting my children than I ever dreamed I would!! I’m not nearly as patient and easy going as I might have thought I was before. Often, God uses situations with my children to show me my own lack of self-control and sinfulness. Even when it’s hard and I’m frustrated beyond belief, let me demonstrate Your love toward her. Romans 5:8 tells me that even when I was steeped in my sin, Christ loved me enough to die for me. No matter how unlovely she is in her moments of rebellion, I can allow the fruit of the Spirit to show love through me to her. God has placed into our homes exactly the children He wants us to parent. May we seek His help through prayer every day to train those children in a way that brings Him glory. Do you have any goals for your family? I’m not talking about a written-down list of what you want to accomplish together, though I think that’s a great idea! 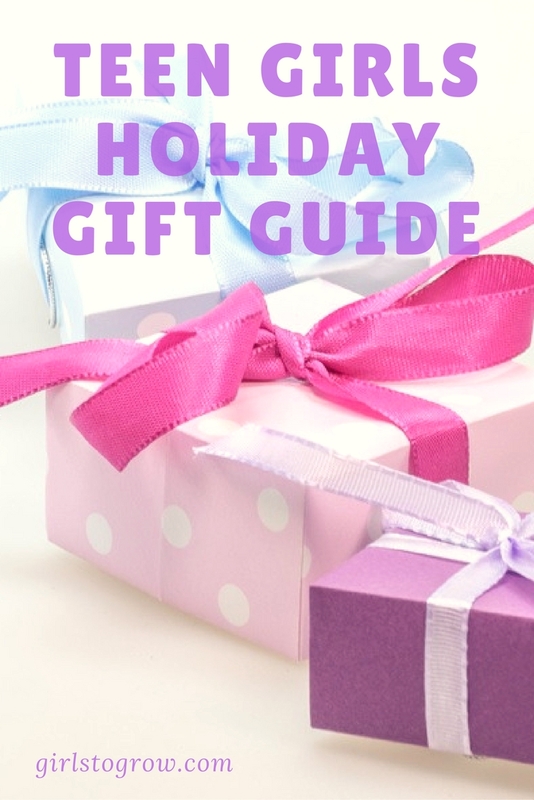 The only list of that type we have at the moment is a general list in our heads of trips we’d like to take, places we’d like to visit as a family. Let’s go deeper than that. How do you want your family members to feel when you’re all together? I know that I want each person to feel safe, loved, and accepted exactly as they are. Whether it’s a wacky sense of humor or a deep-seated fear of spiders, we all should feel comfortable being ourselves when we’re together. I want us to enjoy spending time with each other, to create family memories, to have moments that we can all look back on with shared fondness. I love hearing our daughters talk about memories from their younger years, though that often turns into retelling stories about when they got in trouble for something! I think we all want to build this sense of love and security into our families. 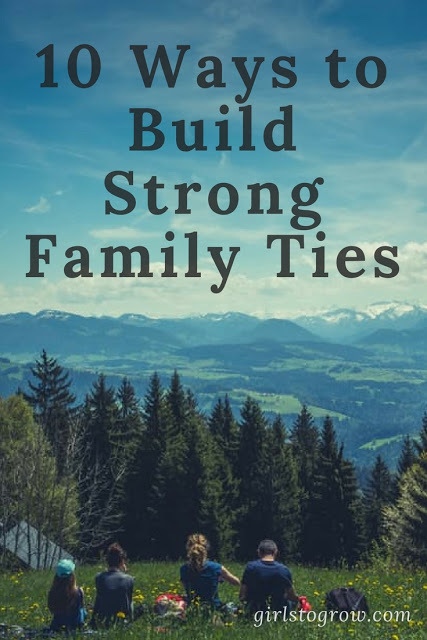 I need to actively look for ways to cultivate that spirit, so I wrote out a list of ten ways that we can build strong family ties. 1. Pray together. Here’s a great foundation for the rest of the list! Our hearts are united as we pray for needs to be met, then rejoice together when prayer is answered. We all know when someone in the family is going through a difficult time, and it’s a comfort to know that the whole family is praying for you. 2. Share family meals. Do this as much as you can when your children are small, even though it will be hard at times and all kinds of messy. 🙂 Speaking from experience, it gets much harder when your kids are teenagers and have practices, games, and other activities in the evening. These days I really treasure the nights we’re all around the table at the same time! It’s fun to hear about the girls’ school day, and to just slow down and reconnect after a busy day. 3. Support each other’s interests. As much as possible, we all go to the girls’ piano recitals, basketball games, and school concerts. It’s fun to rehash the highlights together afterwards! It also helps us be able to encourage each other in our interests. My parents were wonderful examples of this when I was growing up. 4. Volunteer as a family. Whether at church or in the community, take advantage of every opportunity to serve others as a group. I like to have the girls help me when I work in children’s church, vacation Bible school, or the church nursery. 5. Read an exciting book aloud. It’s fun to experience the story together and discuss what might happen next. We might also listen to radio series like Adventures in Odyssey in the car when we’re on long trips. 7. Have friendly competitions and include a prize for the winner. Each March, we all fill out NCAA basketball tournament brackets; the person who gets the most points chooses a restaurant for our next night out. Even though the girls and I aren’t that knowledgeable about which teams are the best, we still have fun competing. 8. Explore new places. While an actual vacation is nice, this could also just be a visit to the local zoo or a bike ride at a park you’ve never checked out. Once they’re old enough, involve your children in the planning of trips and activities when possible. 9. Respect each other by listening – and not interrupting – when someone else is talking. This is a valuable skill both inside and outside of our families! We need to listen to each other and really hear what the other person is saying instead of just forming our answer and sharing our opinion. 10. Institute family traditions. If you’ve read here long, you know this is one of my favorite ideas! Our next tradition on the calendar is in February. Each of our girls always get heart-shaped boxes of candy from their dad on Valentine’s Day. I’ve tried to create a certain tradition around every holiday. As Gretchen Rubin says, “The days are long, but the years are short.” Let’s gather our families around us and build strong ties that will give us great companions as we walk through life, those who will celebrate our victories and walk with us through our struggles. What are other ways we can strengthen ties within our families? Have you ever experienced information overload? I’m a planner by nature. If my family is taking a trip to a location we haven’t visited before, I want to check out everything the area has to offer – all the hotels, restaurants, and the sights we might want to see. But it doesn’t take long until I just feel overwhelmed with ALL the information. There are so many websites to check out – I could get lost in the internet for days. 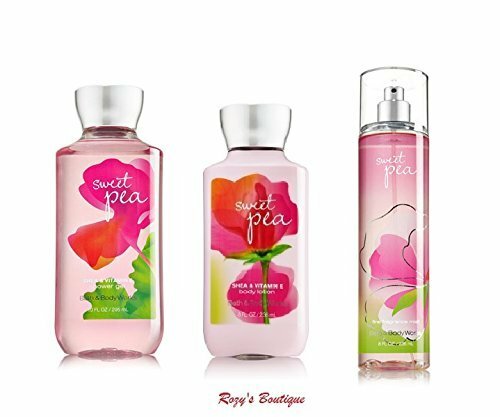 How do I know which reviews are reliable? Is that tourist attraction really worth our time? Is that the best hotel rate I’m going to find? Here’s my point. Sometimes we’re so overwhelmed with information that we don’t know where to start. I believe that as Christian moms, we want to raise wise children. This doesn’t necessarily involve book smarts; rather, we want them to make good decisions and insightful choices. I’m glad to know that we don’t have to search all around to find the best ways to teach our children about wisdom. The book of Proverbs gives us advice for every area of life, from relationships to money to how to conduct business to generosity and self-control. 1. He that walketh with wise men shall be wise: but a companion of fools shall be destroyed. ~Proverbs 13:20 This boils down to choose your friends wisely. This is important when our children are young, but even more so as they hit the middle school and high school years. We become like those we spend our time with. 2. Lying lips are abomination to the LORD: but they that deal truly are his delight. ~Proverbs 12:22 Tell the truth always, even when it’s hard – and it will be sometimes, even as adults. 3. He that is slow to anger is better than the mighty; and he that ruleth his spirit than he that taketh a city. ~Proverbs 16:32 Learning to control your temper takes hard work – and the help of the Holy Spirit. The second part of this proverb deals with any area of self control. Handling your emotions wisely is more valuable than being physically strong. 4. The soul of the sluggard desireth, and hath nothing: but the soul of the diligent shall be made fat. ~Proverbs 13:4 In other words, the lazy man wants lots of things, but has nothing, while the diligent person will be made rich. Work hard, be thorough, and you will be rewarded. Gaining wealth isn’t in and of itself a worthy life goal, but it’s typically a byproduct of hard work and perseverance. 5. He that hath a bountiful eye shall be blessed; for he giveth of his bread to the poor. ~Proverbs 22:9 Bountiful here means “generous.” When you work hard – as we talked about above – you will be able to be generous, which brings further blessings on your life. 7. Hear counsel, and receive instruction, that thou mayest be wise in thy latter end. ~Proverbs 19:20 Listen to those who are older and wiser than you, and you will learn much. 8. Whoso keepeth his mouth and his tongue keepeth his soul from troubles. ~Proverbs 21:23 How much trouble we would all avoid if we could control what we say! While it will take more than a lifetime to work on this, it’s good to help our kids begin to understand the importance of the words they use. Those words can wound or heal, hurt or help. 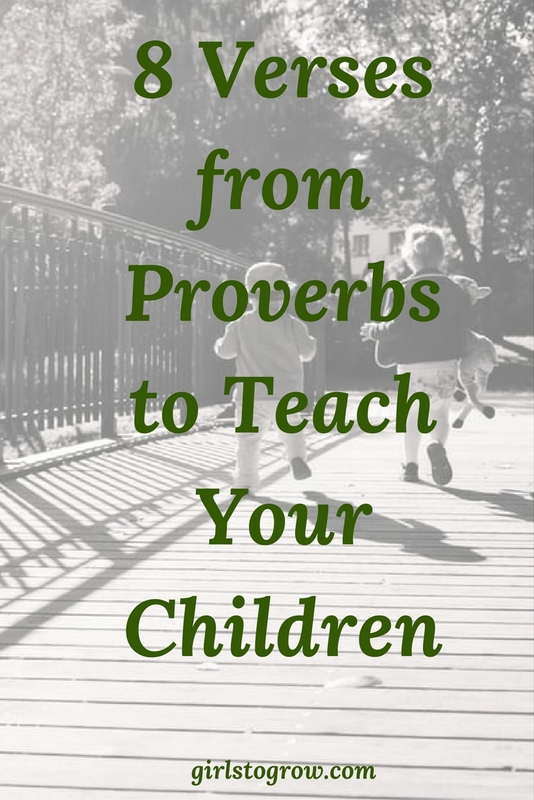 When our kids were younger, I loved having stories that illustrated the principles in Proverbs. I haven’t mentioned them in a while, but Wisdom and the Millers and Those Kids in Proverbsville were books of short stories that we enjoyed reading together. 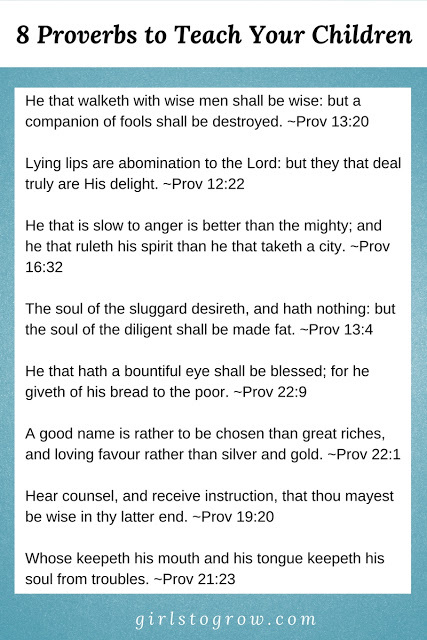 I created a free printable of these eight Proverbs if you’d like to have an easy way to reference it. Click here to access the printable. Is there another verse from Proverbs that you would add to this list? I think that captures what it’s like to be a teenage girl sometimes. On a good day, life is, like, ultimately good, like, happiness unbounded, like, dancing around the house and hugging your sister. Yes, that marks the best of times indeed. Then there are the worst of times. The tears for no reason…though those are better than the tears flowing because of a friend’s betrayal, or a classroom humiliation, or rejection from some group to which you so desperately wanted to belong. The worst of times brings self doubt, and a critical eye turned inward, and sometimes, a broken spirit. 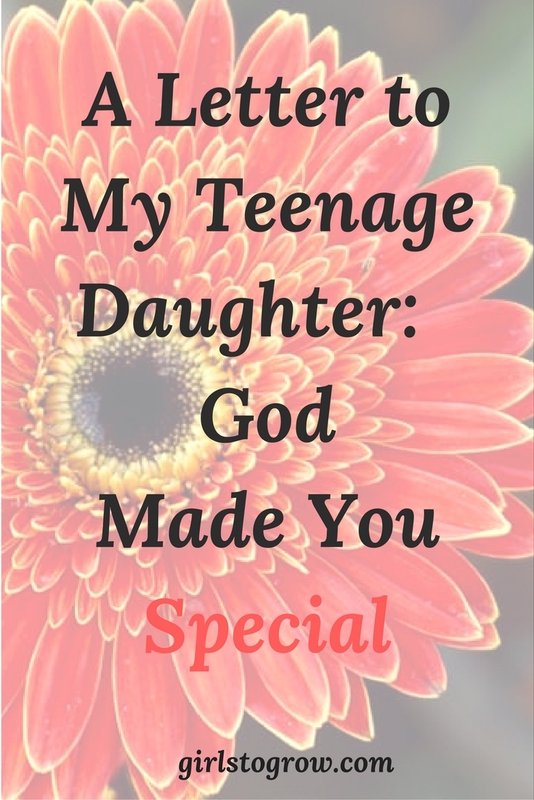 On those days in particular, I want you to remember that God made you special. I know you think I’m just saying that because I’m your mom…and I am. But I’m also saying it because it’s true. In these teen years, while you’re growing and changing and learning who you really are, it’s easy to want to be someone else. You see what makes a certain girl popular, why that girl has so many friends, how she seems to know just what to say or do to attract boys. Perhaps it’s that other girl’s confidence when she gets up in speech class or another friend’s ability to excel in every sport that you want for yourself. And maybe you feel less than, inadequate, because you don’t have those same skills. It’s so easy to say “be comfortable in your own skin.” Yet sometimes you can feel like your skin doesn’t fit, that it doesn’t look right to other people, that it’s not who you want to be. But who you are is special. God created you. He tells us in Psalm 139 that we are fearfully and wonderfully made. Yes, you know that phrase, “fearfully and wonderfully made.” But that’s certainly not always the first thought you have about yourself. Let’s dig into it for a minute and see what it means. You were created with great reverence and heart-felt interest, The very God of the universe is interested in you and in how your life plays out every day. You are unique and marvelous, a one-of-a-kind creation. Every personality trait, every quirk, the activities you enjoy, the pursuits you’re really good at ~ they’re all gifts from a Creator who makes no mistakes. Introverted or extroverted, musical or artistic, a watcher or a doer, detail-oriented or a free spirit, you are the way you are for a reason. God has a plan for your life, a purpose for you to fulfill, a life to live that no one else can live in the same way. You’re not exactly like anyone else, and that’s just how it should be. You are made in the image of God. Cultivate that part of you that longs for a relationship with Him. Let His love, peace, and grace seep into your soul. Be authentic. Like what you like, be who you are, don’t conform to fit someone else’s standard for you. Be gracious, kind, and thoughtful, but be you. Give grace to all those girls around you. In spite of what it may look like from your vantage point, they have doubts and insecurities just like you do. You might never know how an encouraging word helps them through their own difficult day. And your dad and I? We’re your biggest fans, your loudest cheerleaders, your prayer warriors. We love you, just the way you are. I don’t remember why I memorized Luke 2:1-20 as a child. It may have been for a church Christmas play or a school program, but I committed that passage to memory many years ago. I can still recall most of it today – if you’re not grading me on it! 🙂 It’s also the Scripture we read together as a family each Christmas Eve before our kids go to bed. 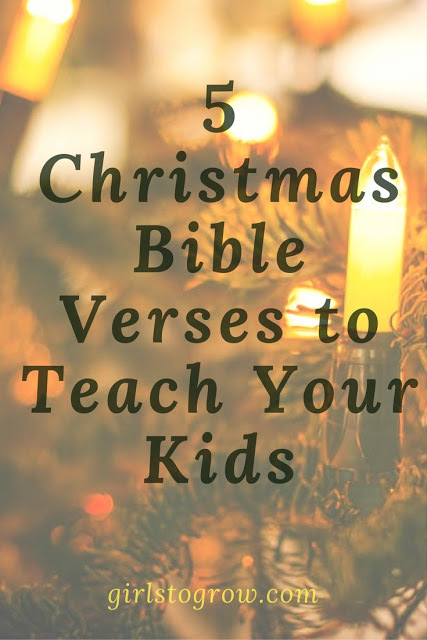 If your children are very young, however, that’s a lot of verses to learn! 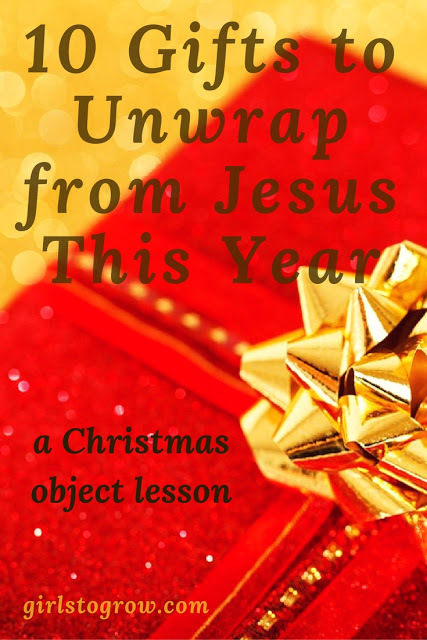 I pulled together a list of five short verses that you can use to introduce them to the whole Christmas story. 1. “Behold, a virgin shall conceive, and bear a son, and shall call his name Immanuel.” ~Isaiah 7:14b Talk to your children about God’s promise way back in the Old Testament that He would send His Son to save us from our sins. 2. “And the Word was made flesh, and dwelt among us…” ~John 1:14a I like to use this verse to teach that Jesus was God, made in the likeness of man, who left Heaven’s glories to come down and live with the people that He had created. 3. “And she shall bring forth a son, and thou shalt call his name Jesus: for he shall save his people from their sins.” ~Matthew 1:21 Introduce the characters in the Christmas story. God chose Mary to be the mother of the Messiah, and Joseph to be His earthly father. I marvel at the faith these two had! 4. “For unto you is born this day in the city of David a Savior, which is Christ the Lord.” ~Luke 2:11 The heart of the Christmas story is here as angels announce to shepherds on a hillside that the Savior has been born. That good news has been shared countless times in the thousands of years since then! 5. “And when they were come into the house, they saw the young child with Mary his mother, and fell down, and worshipped him…” ~Matthew 2:11a Here we have the addition of the wise men to the Christmas story. These men traveled a long distance just to worship the one whose star they had seen back in their homeland. Have you ever memorized part of the Christmas story from Luke 2? As a mom, I especially love verse 19, which tells us that Mary pondered in her heart all that had happened around the birth of Jesus. I think it will be neat to hear her relate the story when we get to heaven! This is the season of birthdays in my extended family. 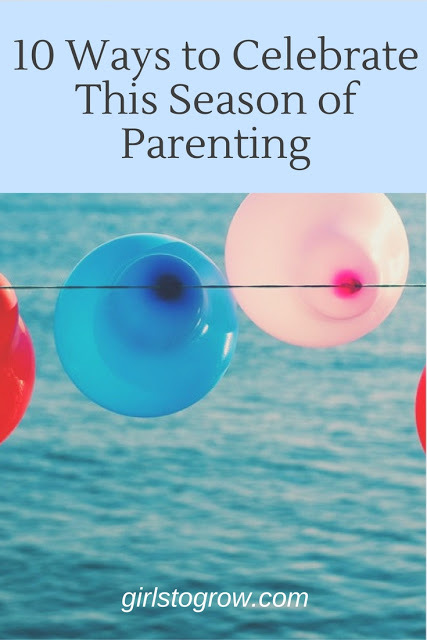 As I mentioned in my newsletter earlier this month, both of my daughters, my mom, my sister, a sister-in-law, two nephews, and one niece all celebrate birthdays in the span of about six weeks. Few qualities in life rival a spirit of contentment when it comes to determining personal happiness. Being satisfied with what you have and not constantly looking for “the next best thing” is a trait I want my own children to embrace. 1. Emphasize gratefulness. When our girls were younger, it felt like I was constantly reminding them to say “thank you” at the appropriate times. (And just to encourage moms of littles, all that reinforcement does pay off, as our children now do it voluntarily.) Verbal thanks and written thanks – in the form of thank-you notes – help us remember to be grateful. Yet those outward expressions stem from a grateful heart, which is what we need to carefully cultivate. 2. Eliminate comparison. This is such struggle sometimes, even for me. I don’t know if we can entirely eliminate comparison, but I think we can learn tactics to keep it under control. I’ve written before about my struggles with comparison in Releasing Yourself from the Comparison Trap and in a review of one of my all-time favorite books I’m Happy for You (Sort Of…Not Really). Media in general – and especially social media – leads us quickly down the road of comparison, so I’m trying to train myself to truly be happy for what I see others enjoying without feeling a sense of lack if I don’t have those same things or experiences. 3. Appreciate what you already have. Point out, “Isn’t it nice that you’re able to have a warm coat to wear on this freezing cold day?” We’ve also tried to teach our children to take care of their possessions by putting things back where they belong when they’re finished using them, cleaning something when it gets dirty, etc. 4. Value relationships over possessions. Our relationship with God should be our first priority, followed by relationships with others. We can talk with our children about how we spend our time. Are we building friendships and encouraging people or is our focus on getting more for ourselves? My children need to see me living this out in front of them. 5. Show them how to be givers. We can teach our children to be generous not only with their money, but also by sharing their things with others and by giving of their time. Again, I need to be setting the example here. 6. Teach them that happiness doesn’t come from owning lots of stuff. While buying that new shirt and wearing it for the first time will bring temporary pleasure, it’s only a matter of time before it ends up on the closet floor or in a box headed off to Goodwill. It’s okay to own nice things, and God does give us all things to enjoy, but we won’t get lasting happiness from any possession. 7. Remind them that God provides all that we need. Everything we have comes from God, and is what He has designated for us in His perfect will. He gives us what we need when we need it. There are countless blessings all around us that we can thank Him for on a daily basis. 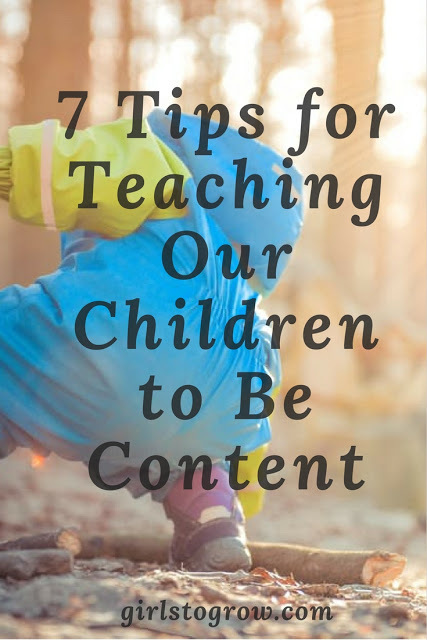 May we as parents grow in this area of contentment as we seek to instill its value in our children!